With the forthcoming version of Robot 8.1, ip-label is making its new mobile server (AMS= Active Mobile Server) available to Newtest users. Newtest Robot is built on a new Active Mobile Client (AMC) which makes it possible to connect to the telephone in a controlled way, in other words, by checking internet connectivity before starting a test. Remote control of the phone via the AMC is done with the existing Newtest image check and keyboard input functions. New Newtest primitives are additionally available with Robot 8.1 to start up an application, return to the main page, etc. – for Android: a server running MacOS, Linux server, or Windows server may be used. – If you want iOS, a physical server running MacOS will have to be deployed. Then it would be beneficial enable sharing in order to connect Android telephones. – If you want only Android, the AMS server can be deployed on a Linux or Windows server. 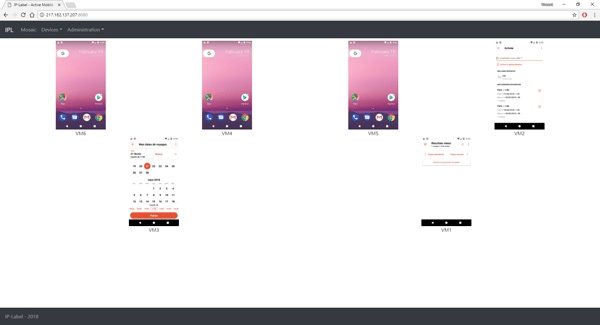 Note that with Android, a virtual Android emulator can be connected instead of a physical terminal for a 100% virtualized architecture.